The Hierophant tarot card represents religious doctrine as a path to spiritual progress. The Hierophant tarot suggests that devoting yourself to a religious teaching, accepting its positive message, and faithfully observing its traditions leads to an understanding of its greater mysteries. In the Hierophant tarot card, the grey pillars represent the principles of religious doctrine in perfect balance and harmony. That is why some religious or spiritual paths are very serious about their followers memorizing specific prayers or practicing devotional activities during certain times of the day. The Hierophant tarot card is a bit like Dan Brown’s novel The Da Vinci Code. The Hierophant points out that a religious tradition’s symbols, scriptures, and rituals are the outer form of an inner, or esoteric tradition. The crossed keys before the Hierophant’s feet signify that the outer, or exoteric form of spiritual doctrine is preserving its hidden, or esoteric, mysteries. Observing the countless rituals and prayers will reveal the mysteries they conceal. Your faithful efforts will pay off in the end. That’s why the robes of the monks kneeling before the Hierophant are embroidered with roses and lilies, symbols of physical and spiritual love. But the Hierophant is not keeping his devotees completely in the dark. The Hierophant’s yellow crown and staff tipped with the triple cross are important clues. They explain that the religious principles expressed in the Hierophant tarot card reach into the material as well as the spiritual world. Even better, they can be understood by the human mind! The Hierophant’s red and white robes show that while these principles are rigid, they are actually life affirming and inspired by love. The monks/priests are shown in the Hierophant tarot with tonsure (the shaving of a spot on or the whole head as a symbolic gesture denouncing vanity and earthly ego). One wears a robe adorned with white Lilies (thought), the other a robe adorned with red Roses (desire). With his free hand, the Hierophant gives the sign of benediction, or blessing. Study and devotion to your spiritual path have given you insight into its inner mysteries. You have diligently memorized the required prayers and observed the traditions of your faith, and you have done so dutifully but not blindly. Hence, The Hierophant tarot is the card of upholding tradition while still being willing to buck “the system” when and if the time is right. 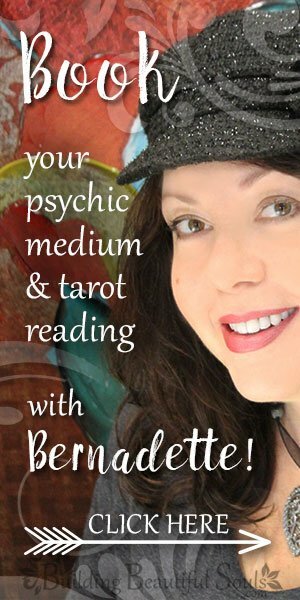 When The Hierophant tarot card comes upright to you in a reading, it could be letting you know that now is the time to stick to what is expected and accepted as ‘normal’ procedure. Paying attention to important clues and asking the right questions, you have arrived at the right conclusions. Now that you understand the importance of seemingly insignificant or contradictory details, it is all coming together. As this insight enriches your religious experience, it also reconciles the teachings of your faith with your moral and ethical perspective. In other words, you know that the letter and spirit of the law do not have to be in conflict with each other. Far less dramatic than The Chariot, The Lovers, and The Emperor, the path of The Hierophant often requires stubborn determination, and this is why this card astrologically corresponds with Taurus. The insights you have gained are now placing you in a position of authority, because you are now able to explain complex spiritual ideas in simple terms. Others are seeking you out to study under you or to seek advice in spiritual or ethical matters. Your advice tends to favor doing the thing, even if it may put the person asking you at a disadvantage. This does not always sit well with others, and sometimes it feels like you are shouting against the wind. Others often admire you from afar, but they are afraid to get close to you. It could be that they don’t feel worthy, or they may fear you will judge them too harshly. While no one should expect you to abandon your principles, being more patient with others will make your position not so lonely. If the Hierophant card represents someone else, it points to a learned and wise person from whom you could learn a great deal. While the Hierophant is neither arrogant nor judgmental, you will need to approach him with courtesy and respect. 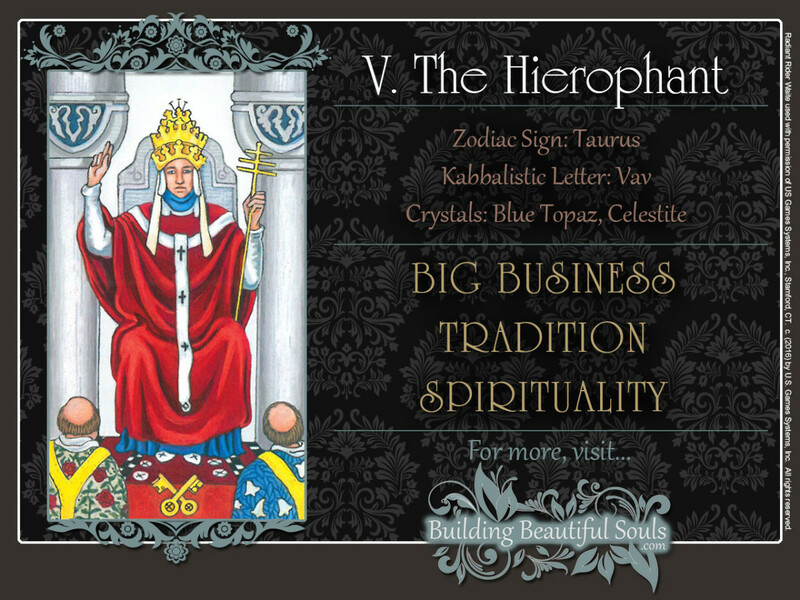 The Hierophant tarot card represents spiritual or moral authority gained from a thorough understanding of tradition. When this card is reversed, it is often a painful reminder that this authority is not physical. While you can teach others the difference between right and wrong, you cannot prevent them from making poor choices. For example, you may have explained to a friend how his actions are hurting his loved ones and during the conversation it seemed that he finally saw the light. The next day you discover that, having learned nothing, he immediately returned to his negative behaviors. Reversed, the Hierophant card can also show inflexibility and intolerance toward others. This may stem from a too rigid or even false understanding of your own principles. For example, you may scold a child for speaking disrespectfully to his mother in a public place, not knowing that the two were only kidding around. Or you may scowl when you see a husband walking in front of his wife on the crosswalk. This may seem rude to you, but in many Native American cultures, for example, it would be rude for the husband to walk behind his wife. Remember that while your principles are universal, they are often expressed in a variety of ways. If the reversed Hierophant tarot represents another person, such a person tends to be rigid in his thinking. His closed-mindedness often stems from a too narrow interpretation of his beliefs and values, which generally indicates that he is not really in touch with them. While there is nothing wrong, for example, with choosing a vegetarian diet for ethical reasons, labeling meat eaters as murderers and barbarians is questionable. If this person presents himself as a spiritual teacher, you need to approach him with healthy skepticism. His knowledge may not be as in-depth as he would have you believe. The Hierophant is the fifth Major Arcanum. In Numerology the Number 5 is associated with Mercury, and it points to a deep intellectual understanding of a wide range of topics. In the Hierophant tarot card, it is interesting to note that the pentagram, the five-pointed star drawn in a single stroke, combines the four elements – Earth, Water, Fire, and Air – with a fifth element, Spirit (aka Aether or Ether).